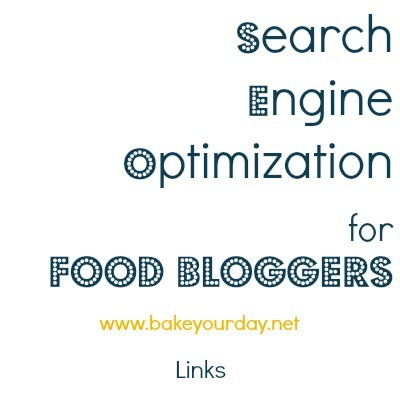 SEO for Food Bloggers continues with a chat about link. Originally I had promised that recipe formatting would be included this week. I thought it would but the truth is that the topic of recipe formatting and rich snippets needs to be its own post. I started to add it to the end of this one and decided that I would extend the series to add an additional week. This week’s post will give you some more “homework.” Not because I’m the teacher-type but because many of you said that you loved having the tasks to take away from the post that I provided last week. Feel free to leave your questions or comments in the comment section below or email me! Links are important simply because they build credibility with search engines. The more people linking to you, the better you are. Link to others, outbound links are good for SEO and also, it’s nice to link up to other bloggers! Linking to yourself is a good thing, too. When you link to someone else’s blog or to another article, use descriptive anchor text. What I mean by anchor text is the actual word or phrase in the paragraph that is linking to the other article. See the recipe for Mushroom & Wild Rice Soup. In the first example, Mushroom & Wild Rice Soup is the anchor text; it describes what the link is linking to. In the second example, “here” does not describe the post and therefore, a search engine will not be able to easily tell where that link is going. Use this practice also when linking to yourself. Be consistent with permalinks so that readers can easily access them. Search engines will not be able to recognize that “slug” and won’t be able to index the post based upon the URL. WordPress gives you an easy way to setup how you want your URL’s to look. Go to your dashboard>settings>permalinks and then choose which one you’d like. Choose any of them but the default. If you like the date in there, feel free to leave it, same goes for the category. I choose not to include those because I like a clean, simple URL that people might be able to remember. If you can’t find the settings, look underneath the post title and you’ll see where it says “Permalink”; you can manually change it here too. I’m not sure anymore how Blogger does this, so if you know, please leave it in the comments below and I’ll add it in later. Check you reader’s top five posts and your five favorite post to ensure that the permalink and any outbound or internal links are anchored correctly. If you have time, start going back to several posts to fix the anchor text from “here” to something more descriptive. Don’t worry – I need to do my own homework on this one! I think most of my permalinks are good. But I am so guilty of click HERE… or linking words like, I saw THIS today…. I will be going back and making changes to old posts this weekend. Thank you so much for this series… such a big help! Ugh – I so need to get better at this. I love this series my dear!! Such wonderful information Cassie! You are so great to put in all in one spot for us! this is SO helpful! I never change my permalinks. But now I’m going to. I find this SEO stuff fascinating. Thank you SO much for the Cassie!! Cassie this is so beyond Helpful!! I started working on my SEO a few weeks ago and this is explaining all of thsoe pesky little things i couldn’t figure out on my own. And the Anchor Text is just Brilliant, I am going to be doing LOTS of homework this weekend to make sure everything is done right. I had no idea it mattered to say “here”! Thanks for all the GREAT tips, Cassie! Once I tried to change my permalinks to remove the date from them and totallllllly messed up my incoming links from FG, Pinterest, etc. This was however 18 mos ago and I really am not tech savvy and just thought, oh, well I don’t need that date in there. And things turned into a total mess! But tech problems plague me and maybe you can just change things around but for me, not a good situation! And great reminder to type out the anchor text, not just ‘here’ is the recipe with a link to ‘here’. Hmmm…do you use a redirect plugin? I think Lindsay installed one for my site since I had moved from Blogger to WP and it it redirects any old links to the new links. Thanks for another great post! I have a question about links. Does it matter if we have text that appears when people hover over a link? Should we be filling in the field that makes this text appear and make sure that it’s good descriptive text? Or do search engines not look at that hover text? Thanks! Hi Christine, I don’t believe that the hover text is important but I will try to do some looking into it. I think that as long as the HTML is coded correctly, search engines should be able to read it. if you change the permalink settings in wordpress settings, will pins to your website still work or will they come up as not found? Hi Melissa, they will not unless you use a plugin that redirects for you; and sometimes your host will redirect. I use the Smart404 plugin that redirects all of my links. Let me know if you have any more questions! Oh gosh – I had the exact same question as Averie. I noticed after one of your last posts that I should change my permalinks so that they don’t include the date and just include the post title. When I switched it under WordPress Permalinks, it changed all the old posts so no incoming links couldn’t find the posts any longer. I think you’re right, Cassie – I must need to find a plugin that will re-direct the old links to new ones that just have the title. I’ll add that to my homework for the weekend. 😉 As before, thanks so much – this is so helpful! These posts are so incredibly helpful and I admire you very much for sharing! More awesome tips, Cassie! Thanks so much for this awesome series. I have been looking forward to it each week. Man my head is spinning after all these SEO posts. Lots of homework to do. I hope it is easy with Blogger. And I really need to look into upgrading to WordPress soon!! I had no clue either that linking with HERE would matter either. So helpful! THanks Cassie! I know this is a lot of work. We all appreciate the work youre putting into it! Again, thank you for doing these posts Cassie! I just went and changed my permalink setting and will be doing the rest of my “homework” this weekend! I have a questions though! Should I title my links? I use wordpress and when I link to something it asks me to provide a “title” for the link. As I understand it this is the text that comes up when you hover the mouse above the link..
Hi Yvonne, I don’t think it will hurt but I have never been told that will help your SEO. Such a great post! I really need to start doing the anchor text from here on out! I am loving this series Cassie. You have made it SO clear and easy to follow. Thank you! Oh darn all of my “Have you seen THIS?” clickable links! Definitely going to have to change this habit for the future. I never knew it could make a difference to your SEO! Thanks for the tip. I KNEW there was a reason why some people were not using the “click here” phrase … now I know the reason!! 🙂 THANKS SOOOO MUCH, Cassie! I owe you dinner and dessert! And, thank you for taking the time to teach us… this is so, so kind of you. This series has been super helpful Cassie and I am going to spend some time over the next couple of weekends to do the “homework”. So much more goes into a successful blog than meets the eye, doesn’t it? Thank you! I’m totally new at blogging and appreciate all the information you provided! Thanks a lot for this series. I have been blogging for 8 years, never worried about SEO. Now I want learn everything about it. Your posts are so helpful and I have a LOT of work to do!! Hi Cassie. This is my second time reading the SEO series and a lot more is sinking in! I am using blogger and wanted to let blogger users how to change the permalink. It is really easy. When composing your post you have a dashboard along the right side. There is a permalink section. You can either pick automatic or custom permalink. Choose custom and type in your keywords as mentioned above e.g. lemon-blueberry-muffin. Then press save and walla. Hope that helps some of you out there. Another great post! Using correct anchor text that targets keywords you believe your readers are searching for is just the beginning to proper white hat link building. It’s also important to remember not to abuse anchor text as google can penalize your site. Keep up the good work. Cassie, thank you for demystifying Seo for foodbloggers! This content is extremely valuable and practical. I’m thanking you now for all of the traffic you are helping me with! I have never paid that much attention to the permalink and have been using the shortlink. Talk about homework! Thanks again. I wish I had read this earlier. I was always confused why do I get a code in my urls. Thanks for helping.